Fish tanks have barely changed throughout the years. They’re like microwaves, the same basic design with casual improvements. But why settle for something that’s been done before? Your Betta fish deserve the best with one of the best aquarium designs out there! They deserve the Fluval Edge Aquarium kit to be their new home. 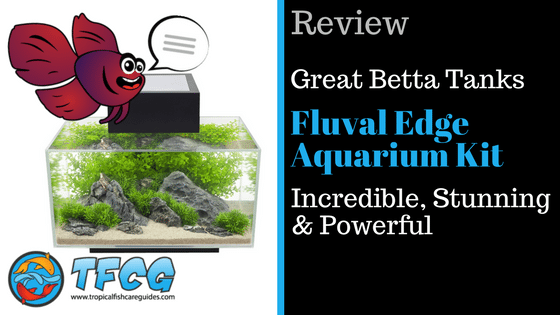 Is the Fluval Edge Aquarium right for You? 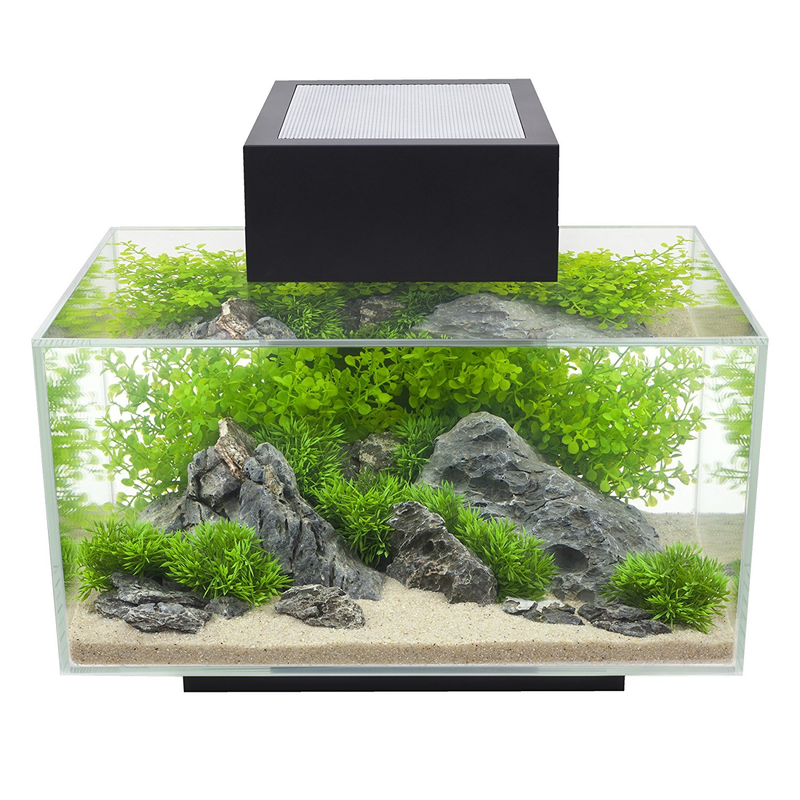 Not only is it trendy and sophisticated looking but the Edge has a gorgeous 3D cube shape that offers an enlivening and attractive alternative to more traditional fish tanks. As one of the best aquarium designs out there, this modern fish tank will draw the eye and compliments whatever room you choose to display it in—and that’s not the best part. The LED light included in the Fluval Edge tank makes it a great alternative to a tabletop light or reading lamp all while providing sufficient lighting for your fish. The Edge aquarium is made up of two elements: the glass aquarium and the gorgeous stand that it sits upon. The pedestal clasps to the tank, making the tank appear to be floating in air, proving novelty and style to the room. Tons of cables and wires sticking out from behind your fish tank is a thing of the past, since any wiring is concealed inside the black column. Best of all, the clear glass top provides an unobstructed view of the interior, meaning that wherever you stand you can have a great view of your fish. And since the cover is totally sealed, you can fill your fish tank to the top and create a wonderful zoo-aquarium effect while keeping water evaporation to a minimum. The Edge is available in a 6- and 12-gallon models. Both are compact and usable on most surfaces in your home. The tank also comes with a 3-step filter which remains out of sight, hidden in the pedestal to keep the aquarium beautiful. The Edge’s three-step filtering process includes mechanical, chemical, and biological filtering so you can rest assured that the water in your aquarium isn’t causing them harm. The power filter keeps the water in your fish’s home clean. The Fluval Edge 6 gallon model comes with 21 LED bulbs in a mixture of blue and white lights and the 12 gallon has an impressive 42 LED bulbs. Both tanks have three display settings: Bright Daytime, Deep Blue Nighttime and Off. This tank allows you to set the mood: full lighting will provide enough light to read by while turning on just the blue lights will create a cool nighttime vibe. The natural looking light that the LEDs create allows you to admire your fish and tank décor clearly and appreciate the full beauty of your marine animals. The pump responsible for circulating the water through this filter is whisper quiet so no need to worry about it keeping you up all night. As the water passes through it, it flows through mechanical, chemical, and biological filtering media, which cleans the water and removes waste so that your fish, as well as any plants, remain healthy and happy. The Edge is compact, meaning that it is bound to fit and provide light to awkward or boring spaces in your home. 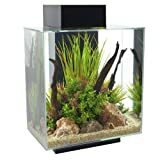 The Fluval Edge aquarium has been meticulously designed and the 6-sided, all-glass tank will add a touch of class to any room, whether placed in a swanky condo or in a log cabin. The combination of glass, water and light is sure to bring up memories past of sunlight dancing on the ocean waves. Overall, this is a great tank for the savvy fish owner. 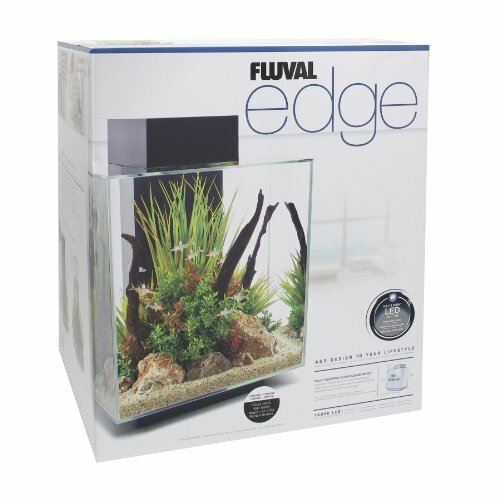 Setting up the Fluval Edge is quick and easy, only taking a minute to assemble max. The cover is removable for easy cleaning and ensures the aquarium doesn’t overheat while the perforating keeps excessive moisture from building and the cover also allows the user to easily access the filter. The pump starts out a little loud, but decreases in volume over time or if you use 100% marine safe silicone lubricant on the pump. So, not only is it visually stunning, but it performs well as a fish tank too, making it a great purchase. The only thing that is bothersome with this tank is that it is difficult to clean. Since it doesn’t have a removable cover, there’s only a small hole in which you can remove your fish and do the necessary cleaning. This can be made easier with magnetic tank scrubs and siphons, but often times you’ll have to stick your arm in at awkward angles to get the tank totally clean. You’ll have to rearrange the decor a bit to get gravel or sand clean or move things out of the tank completely as you clean. Also, if air bubbles get in the top of the tank, it may be hard to get out. Such is the cost of an awesome tank design. That shouldn’t be a problem for most people, but rather irksome for the perfectionists out there. Cleaning Tip: One customer has come up with a great cleaning regimen to easily keep the tank clean while using minimal effort, which you can find in the review section of the Fluval Edge. 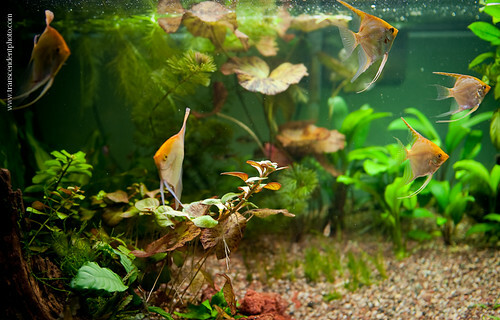 Some easy tips include establishing the nitrogen in your tank, using test kits to make sure that freshwater, pH, ammonia, nitrite, and nitrate are healthy, keeping the tank heated to about 76 degrees Fahrenheit, using an air bubbler (can be fun ones for kids, like the treasure chest bubblers), and using live plants. With this, weekly maintenance will just be 10–15 minutes of cleaning once a week. It’s not impossible to keep your fish tank clean and sparkling if you do it properly! Cleaning can be a breeze. The pros of this tank definitely outweigh the few cons found in the Fluval Edge Aquarium. It’s an incredibly stunning, powerful tank at an affordable price, and will sure to be the eye-magnet in your house. Your fish will be happy with the amount of space they get and you’ll be happy having an unfettered view of them. Overall, this tank will make both you and your fish happy, so get your Fluval Edge Aquarium kit with ideal lighting today!